We love beets and more often than not we have a couple of roasted beauties in our refrigerator wrapped in foil and ready to toss in a salad, pack in our lunchbox during the work week, or a few on hand to cook this lovely breakfast on a Saturday morning. You could add a cut up baked russet potato and 1/2 a diced onion into the skillet and call it red flannel hash. Today’s beets & eggs are kept clean and starch free. We have been keeping it fairly simple in the kitchen lately, nothing too elaborate. I haven’t followed a recipe in a couple of weeks. I am just sticking to dishes we know and love. I enjoy cooking meals that just sort of come together naturally from instinct. Beets and eggs fall into this category. This breakfast comes together quickly if you have roasted beets on hand. Simply pierce beets several times with a fork, wrap in foil and bake in a 450°F oven for one hour. After cooling off you may refrigerate them for 3 or 4 days. They peel very easily once they are roasted. Heat olive oil in a skillet over medium high heat. Add beets and toss around until well coated. Cook until warmed through and lower the heat to medium. Crack the eggs around the circumference of the skillet. Cover the pan and let the eggs poach until desired doneness. Season with sea salt and pepper and serve with fresh dill and feta. Oh great! Thank you. I did snoop around your blog looking for one and was reminded of that fantastic beetroot curry Jennee made! Like you I’ve been cooking loads of dishes that I really enjoy, instead of trying to combine ingredients, make notes, blah, blah. Most days I just want to eat without the hassle of photos. It’s so nice to be able to enjoy the food for exactly what it is, and when it’s ready. Hmm, if only I could persuade myself into eating beets more often! Although, I do like beets and eggs in salad. And I could do with a really healthy dish. Tthis dish looks like a great combination. Thank you Jovina. It’s a lovely way to eat beets. And also very nice to add potato and onion in the mix! I love beets, have never had with eggs and never thought of that but it’s brilliant. Whenever I roast beets I always make extra to add to salads or to munch on. I really like the name red flannel hash! 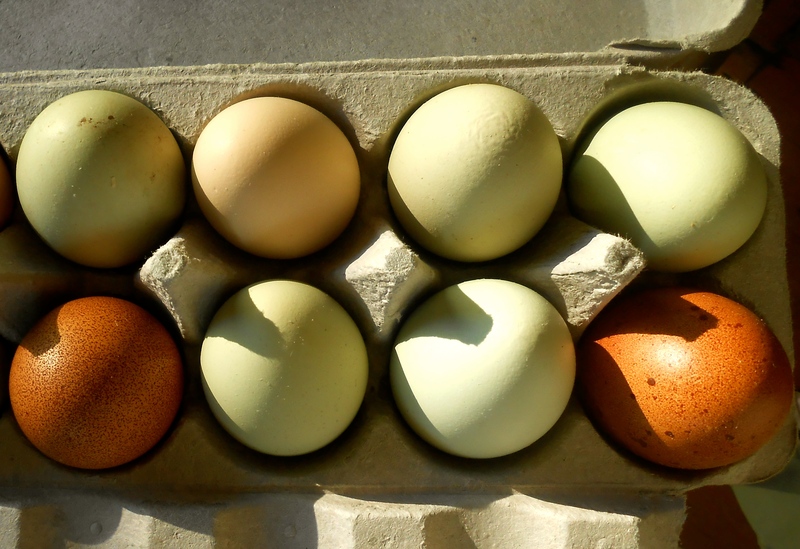 I have serious egg envy, when I used to watch Martha Stewart i would drool over her gorgeous eggs, well here they are again. Just beautiful and your photo with the sun shining on them is breathtaking. I love the simplicity of this, Seana… But yet it screams complexity with the flavors… I’m living the idea of beets and eggs with the dill and feta.. This is my kind of dish. I know I’ll be buying beets the next time I run to the store! I’ve never tried beets with eggs, although I make a beet, fetta and dill salad that is delicious, so I can imagine they are delicious! I am with ya when it comes to following a dish by instinct rather than following a recipe. You have been missing in action Seana. How are you? This is such playful array of colors. Gorgeous. Seems like I have been missing in action a little these past few weeks Sonal, still here, just laying low. :) Hope you are enjoying your start of summer. Thank you for saying hi! Oh I have missed you on blogosphere as I enjoy your posts but yes summer break is a crazy time. July will be like that for me :). I know. I am about to get really busy here in two weeks. Hope you are doing something fun! Kids being home is fun enough ;)! Right? Their grandparents are visiting for the whole month of July. We all looking forward to it. I’ve never had this food combination together before but I bet it’s wonderful, love beets! Really is wonderful Cheri. Can’t seem to get enough beets. Bet you are enjoying the beautiful state of Oregon! The weather is perfect right now isn’t it? We’ve tossed leftover roast spuds into our breakfast eggs but never beets. Love this idea, and any dish featuring fetta and dill has my name on it. Yum! Lovely dreamy photo. What a good idea to roast them and then have them on hand in your fridge! Your simple dish looks delicious! Wow! Great combination. I love it when things just come together. How is it that this has never happened in my kitchen? I adore both beets and eggs, and am always on the lookout for new ways of eating them. This sounds fantastic! Love the color and the addition of dill and feta in the end! I think I know this about you Darya…your love for eggs dishes. :) It’s fantastic, and I can imagine all the other seasonings and herbs that would work really well with this. Makes me happy to know you may make this and enjoy it as much as we do! What an amazing combination Seana – I would never have thought of mixing beets and eggs! The colours are gorgeous, as are your photos! Very nice indeed. Delicate flavours that work well together. Love the colours too. I have a carton of eggs from our friends chickens and this sounds like a tasty way to use some for lunch over the weekend. I can’t think of a nicer gift than fresh eggs! Occasionally we receive a carton from two different sources and I’m always so happy! I find myself savoring them (almost rationing them) and making sure to cook and handle them carefully. Hope you get a chance to try beets and eggs together Karen. It’s wonderful! What a straight-forward, simple, lovely recipe! Perfect for summertime. Thank you Elaine. :) Good to see you today! I don’t much like beets (bad childhood memories), but you motivated me to stop surfing and go make myself some eggs. Thanks!!! Oh boy do I have bad childhood food memories! Funnily I have grown out of most of them…still for the life of me would never eat liver and onions though! Oooo, chopped beets with diced red onion and balsamic vinegar sounds fantastic! Nice idea Luffy, I’ll have to do that one. Don’t you love the color of beets? Wow. How simple and delicious-looking! I’m ashamed to say that I’ve always been weary of fresh beets, thinking that they’re complicated to prepare. Now I want of try it! What a perfect Saturday morning breakfast, especially after a visit to the Farmer’s market with dome freshly laid eggs. The weekend is almost here. Gorgeous post, love the combo. A roasted beet has not yet found its way to our fridge but if somehow I slip a couple past my hubby I will try this. Beets are one of those roots, you love them or you can’t stand them. I didn’t like them as a child, but then I only had them from a can. I love them now! Roasted is so delicious. Hope you get the chance to slip one past your hubby. True! Jon never liked them… then we grew our own and roasted them with rosemary and thyme, splash of vinegar and salt and he about died from happiness. Funny how things change. Great story. Oh, I see what you mean by slip one past him…there are never any leftover! What a pretty breakfast! I love beets. I’m so glad you shared your way of roasting beets. I’m going to do this – this weekend. Also love the combination of beets and eggs. I’m doing the same thing – in fact – scarcely cooking at all. A lot of salads of organic greens with a simple balsamic vinaigrette and a fried egg or grilled mushrooms on top. Oh yes – your photograph is wonderful – the colours are fabulous together. I love green salads with “cooked” things on top! Grilled mushrooms sound exceptionally good. It’s a matter of fact, I am enjoying a green salad with farro right now! :) You’ll be roasting beets and I’ll be mixing up a homemade environmentally friendly weed killer! How dreamy is your picture…pretty! I just noticed the freshly laid eggs!! Nice! I just can’t seem to get into a rhythm of cooking something new these past few weeks. :) Thank you…. 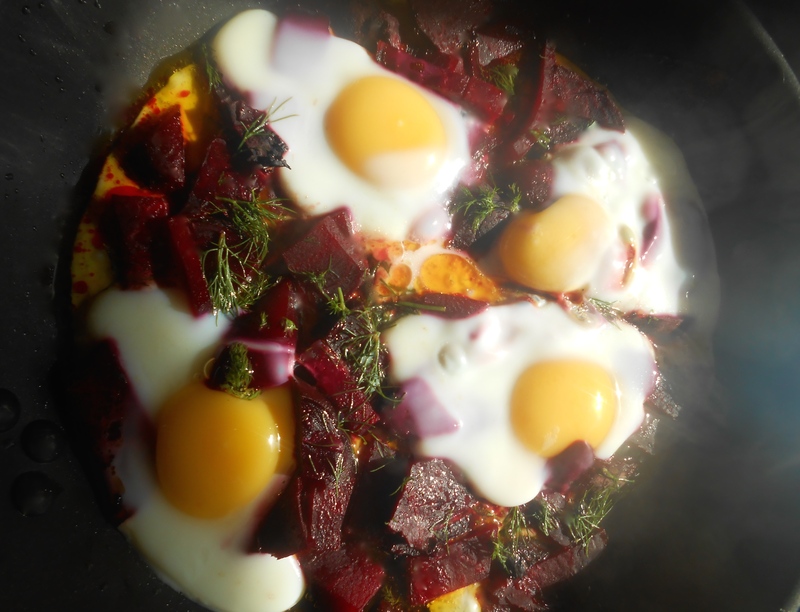 Great idea – I love roasted beets and poached eggs are a staple – together they make a beautiful dish – thanks for posting! I know exactly what you mean. I get that feeling every now and then too. Thank you so much for stopping by today! Such a delicious combo- definitely got to try this one out! Looks divine! your food photography is getting even more delicious every time I visit. Sweet…I have to say beets and eggs are something I never would have paired together but I believe you when u say it is good! you will not sell me on the beets (one of very few foods I can’t bring myself to like), but I’m all over those eggs. Do you keep chickens? I know how it is Liz. I would not eat bell peppers if it was the last thing on earth! And that is the only food I won’t eat. We do not have chickens. Those particular eggs in the photo came from a friend who keeps chickens. We have toyed with the idea, but, I haven’t been able to get past the fact I would be the one cleaning the coop and I’m just not ready for something like that yet… :) Nice to hear from you! You are currently reading beets & eggs at COTTAGE GROVE HOUSE.